4K video recording at 30fps or 60fps is increasingly on demand since the blossom of 4K UHD videos. As you stream 4K movies, TV shows, videos from Netflix, YouTube, Amazon, Apple iTunes, you may want to screen record the 4K streaming to save the 4K sources locally. And it's a great idea to capture 4K UHD games walkthroughs like StarCraft, Tomb Raider, Dishonored for reading later. Still, screen recording a 4K tutorial for sharing or creating a 4K UHD product demonstration would be nicer compared to HD SD recordings. How do you screen record 4K UHD video on Mac? Via QuickTime player, VLC, or OBS? Some works on 4K screen capturing, while some not. As far as I know, QuickTime behaves well on recording HD SD videos on Mac; VLC does create 4K screen videos in .AVI files that looks pristine, but once you convert AVI to H.264, they lost their quality. So are there any 4K video recorders to screen record 4K UHD on Mac with original quality? 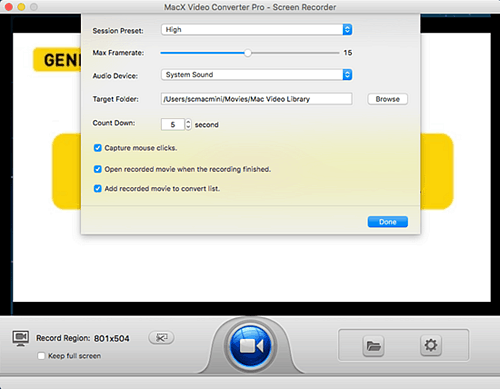 MacX Video Converter Pro comes to the answer. The newly-updated 4K HD screen recorder for Mac enables you to process and screen record 4K UHD, HD videos easily and smoothly on MacOS with remarkable video quality and original audio. No matter you're willing to capture a 4K game walkthrough, create a 4K UHD tutorial for sharing, record YouTube 4K offline on Mac, or record the DRM-ed Netflix, iTunes 4K videos, this 4K screen capture software can carry out all smoothly, no lagging, clogging and interrupting. Besides, if the 4K recordings are not compatible with your devices like 4K UHD TVs, iPhone X/8/7/6S, iPad Pro, 4K video players etc, you can take advantage of this program to process and convert 4K to 1080p/720p HD, VP9 4K to H.264, 4K H.264 to HEVC/H.265. Firstly, free download this 4K video recorder on Mac. It's available on Mac OS 10.5 and above, including the latest High Sierra, Sierra, El Capitan. Of course, if you want to screen record 4K video on Windows PCs, you can grab the Windows version 4K screen recorder as well. Step 1: Launch the 4K screen videos recorder. Fire it up and click on the Screen Record icon on the main interface to get ready for 4K screen video recording. Navigate to the 4K screen that you're playing, regardless of the YouTube, Netflix 4K streaming, 4K disc playback on iMac 4K/5K, or any other 4K sources playback on Mac. 2.1: You can click on scissorlike icon to crop and customize the record region, or tick the box of Keep Full Screen to record the whole display screen. 2.2: Tap on the icon, here you're able to set 4K recordings maximum at 30fps, choose System Sound (Soundflower installation required ) from the Audio Device drop-down list to record screen on Mac with audio. Step 3: Choose destination folder. Click on the Browse button to specify the destination folder to save your 4K recordings. Back to main interface, you can click on the Folder icon to directly open your selected destination folder. Step 4: Start screen recording. After the above steps done, tap on the blue Start Record button to process 4K screen video recording on Mac within a few seconds. You also can stop the video capturing process at any time. What to Do with Your Recorded 4K Screen Videos? After you screen recorded 4K videos on Mac, what can you do with them? Here are the most popular ways that users handle 4K ultra HD recordings. 1. Watch 4K on iPhone iPad Android portable devices. 4K videos won't play directly on iPhone iPad Android not only due to the format and the device's display problem, but also the storage issue. An hour of H.264 4K video could grab 5GB of iPhone iPad storage. So if you wanna watch 4K videos on iPhone iPad Android, you can convert and compress 4K to 1080p or 720p to reduce video file size. 2. Watch recorded 4K screen videos on 4K UHD TVs or other desktops. 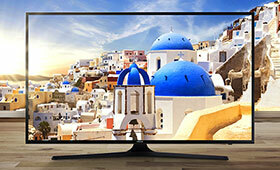 Recording 4K screens for further watching on 4K UHD TVs or computers is wide acceptable as well. But sometimes you find your 4K video cannot play on 4K TV or Mac/PCs. Generally, it's video codec and format issues. The only thing you need do is to convert the recorded 4K videos to 4K TV supported video audio format and convert H264, DivX, VP9 codec 4K videos to H.265/HEVC to perfectly compatible with the Mac supporting macOS Sierra. 3. 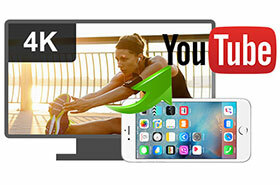 Upload 4K recordings to YouTube, Facebook etc. Uploading 4K videos to YouTube is also a popular thing. But the fact is that H.264 MP4 4K content would be more acceptable for YouTube. So you are more encouraged to convert default 4K H.264 MOV to H.264 MP4. The Auto Copy feature of this 4K video converter would accomplish the conversion 10 times faster than normal 4K conversion, since it omits the transcoding and encoding process. Tips: MacXDVD Software doesn't advocate any reproduce, distribute, transmit, broadcast or sell any content for any other purposes without prior written permission of YouTube or the respective licensors of the content. Please refer to YouTube terms of service before doing so. How to Convert Screen Recorded 4K UHD Videos? 1. Launch the program and click + Video icon to load your 4K video. 2. Choose output format according to your needs. For example, YouTube Video > MP4 for uploading, General Profiles > 4K/2K MP4 Video or MP4 Video (H264+AAC) for watching on Apple TV, iPhone iPad Android, Mac/PC, and more. Or you can also directly choose your device as output format. 3. Click RUN button to start converting 4K videos. It will take very a few minutes to do so. MacX Video Converter Pro is rated as the best 4K screen recorder for Mac. It captures any High definition activities on Mac with good quality, and converts recorded videos to H.264, HEVC, MP4, MOV etc. Better yet, there is no time limit for Mac screen recordings. Here's everything about 4K Ultra HD. You'll find 4K UHD content is more than ever here. Convert 4K UHD to 1080P for smaller file size or non-4K devices. 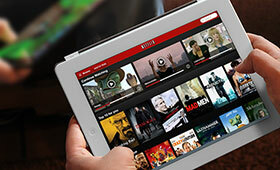 Video resolution converter is shared here to change video res.